In 1958 senior Tiwi artists at Milikapiti (Snake Bay) on Melville Island were commissioned by Dr Stuart Scougall and then Gallery deputy director Tony Tuckson to create 17 Tutuni or Pukumani graveposts. The first major commission of Aboriginal work by a gallery of modern art, this group of Tutuni broke new ground, establishing Aboriginal culture within an art context. Heralding a shift in tradition, the artists made the conscious choice to produce Tutuni for an outside audience. They employed traditional techniques of carving and painting, but made the sculptures from ironwood, rather than the traditional blackwood, which is reserved for ceremonies. The Pukumani ceremony is unique to Tiwi. It is a 'final goodbye', with singing and dancing accompanying the placement of Tutuni around the gravesite. The first Pukumani ceremony was led by Tiwi ancestor Purukuparli for his baby, Jinani, who was the first person to die; as a result, today all Tiwi must follow his fate. Mark Fenech, Art education , 'City Museums & Park Museums', pg. 46-51, Virginia, Jan 2003, 49 (illus.). 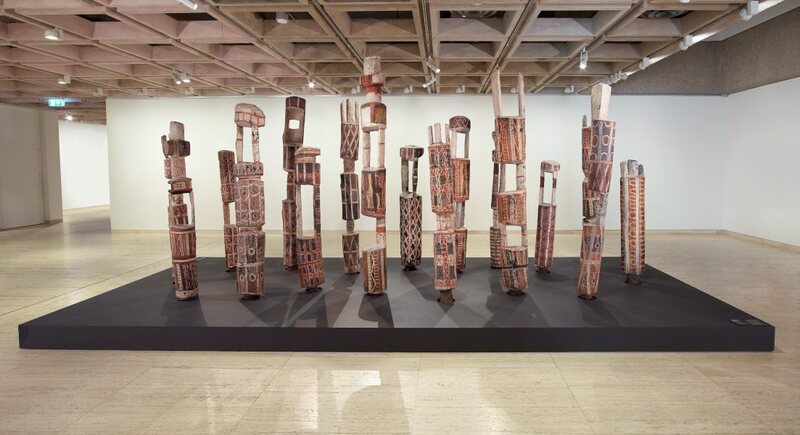 Jennifer Hoff, The Oxford companion to Aboriginal art and culture , '7.6 Tiwi graveposts', pg. 174-179, South Melbourne, 2000, 175 (illus.). Bruce James, Art Gallery of New South Wales handbook , 'Australian Collection: Aboriginal and Torres Strait Islander Art', pg. 208-241, Sydney, 1999, 209 (colour illus.). John McDonald, Art and Australia (Vol. 40, No. 3) , 'Pumpuni Jilamara: Tiwi art: creative freedom and cosmic wonder', pg. 394-395, St Leonards, Mar 2003-May 2003, 395 (colour illus.). Review of the exhibition 'Pumpuni Jilamara: Tiwi art', held at the AGNSW 2002-2003. Steven Miller, One sun one moon: Aboriginal art in Australia , ‘Cultural capital: Key moments in the collecting of Australian Indigenous art’, pg. 29-41, Sydney, 2007, 32-33 (illus.). Howard Morphy, The Cambridge companion to Australian Art , 'Coming to terms with Aboriginal art in the 1960s', pg. 153-167, Port Melbourne, 2011, 157, 159, 267, 357, 365. fig.no. 12.2 (colour illus. ), between pg. 156 and 157; fig.no. 20.1 (illus. ), fig.no. 20.2 (colour illus. ), between pg. 252 and 253. John Mundine and Renée Porter, Art Gallery of New South Wales handbook , 'Aboriginal and Melanesian', pg. 57-71, Sydney, 1988, 58-59 (colour illus. ), 60, 64. Hetti Perkins, Art and Australia (Vol. 47, No. 1) , 'A privileged moment: Retracing Tony Tuckson's pioneering journey north', pg. 108-117, Sydney, 2009, 110 (colour illus. ), 111, 112, 117. NOTE: Hetti Perkins interviewing Margaret Tuckson; Page 110 is photograph of Harry Turnball installing Pukumani grave posts at the Gallery, Page 113-116 are photographs documenting processes in their creation. John Saxby, Sydney Morning Herald, no 15348 , 'A window opens on new stories about building the collection', pg. 26-28, Sydney, 04 Jun 1887, 26. J.A. Tuckson, Art Gallery of New South Wales Quarterly , 'Aboriginal grave posts', pg. 32-34, Sydney, Jul 1960, 32, 33 (illus. ), 34. Ken Watson, Look , 'Pumpuni Jilamara (Good design)', pg. 24-25, Sydney, Mar 2002, 24, 25 (colour illus.). Judith White, Look , 'Looking back at the AGNSW… when there was only one curator: Daniel Thomas in conversation with Steven Miller' edited, pg. 31-34, Sydney, Dec 2009-Jan 2010, 31, 33 (colour illus.). Art + soul: a journey into the world of Aboriginal art , 'Dreams + nightmares', pg. 88-153, Carlton, 2010, 116, 118-119 (colour illus. ), 280. Art Gallery of New South Wales: highlights from the collection , Sydney, 2008, 32-33 (colour illus.). The new McCulloch's encyclopedia of Australian art , ‘Australian Aboriginal art and artists: Exhibitions’, pg. 16-21, Carlton, 2006, 19 (colour illus. ), 74. Group photograph of 'Seventeen ceremonial poles from the Pukamani ceremony' 1958. Commissioned by T. Tuckson and gift of S. Scougall. A material thing - objects from the collection , Sydney, 1999, 8 (colour illus.). Eyewitness travel guides: Australia , 'Botanic gardens and the domain', pg. 100-111, London, 1998, 107 (colour illus.). This illustration details all 17 'Pukamani grave posts' in the AGNSW collection; Acc. no.s P1-P17.1959. AGNSW Collections , 'From Colonialism to late Modernism', pg. 7-106, Sydney, 1994, 96, 97 (colour illus.). Yiribana , Sydney, 1994, 11, 12 (colour illus.). Portrait of a Gallery , 'Tribal Galleries', pg. 42-47, Sydney, 1984, 42-43 (colour illus), 45. Art Gallery of New South Wales picturebook , Sydney, 1972, (illus.). Purchases and acquisitions for 1959 , Sydney, 1959, 47. Art Gallery of New South Wales picturebook , Sydney, 1972, 142 (colour illus. ).